Home / Modern Pest Blog / Is Your Landscaping Attracting Pests to Your Home? Is Your Landscaping Attracting Pests to Your Home? During the spring and summer, many of us spend long hours toiling outside in the interest of home beautification. Weeds are pulled, flowers are planted, and front yards are meticulously landscaped. But what if we told you there are several common mistakes that could attract unwanted pests to your home? Thankfully, a few simple changes are all you need to ensure your home looks its best while keeping insects and rodents at bay. Swing by any home improvement store or nursery and you’ll see a mountain range of mulch bags in assorted colors. This mulch is typically made from wood chips. It is relatively inexpensive, making it a popular choice for adding curb appeal to one’s home. Unfortunately, wood mulch also doubles as an attractant for a variety of pests including carpenter ants, earwigs, roaches, and termites. Both carpenter ants and termites can end up causing thousands of dollars of damage to your home. So you definitely do not want to lure them in! You don’t have to skip out on mulch all together to lower your chance of pests. Rubber mulch not only matches its wooden counterpart in appearance and weed control, it also significantly decreases the likelihood of your garden harboring insects. There are other benefits, too. Rubber mulch is made from recycled tires, helping to keep some of the 290 million scrap tires Americans generate each year out of landfills. Because it’s made of rubber, this mulch doesn’t absorb the water meant for your plants, so more of the good stuff goes to the roots. 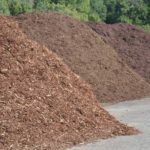 And best of all it doesn’t break down each year, so while you may pay a little more upfront you’ll be rewarded with a mulch that can last up to 10 years. Take a close look at any bush or shrub in your garden. You will likely find a few bugs hiding between the leaves or scurrying along the branches. Plants provide food and shelter to these insects. If planted too close to your house, they also supply a natural bridge into your home which could increase the number of pests you find inside. To avoid bringing the outdoors in, keep plants trimmed back with plenty of space between the branches and your house. A good rule of thumb to follow is an 18 inch buffer. This also applies to trees. Since branches near your roof provide nuisance wildlife such as squirrels with easy access to your chimney or attic. 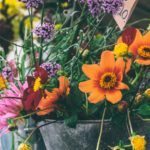 Many people choose what to plant based off of appearance alone, but there are several ornamental flowers and herbs that also do their part in repelling insects. Marigolds: These fragrant blooms are known to repel mosquitoes, aphids, and even rabbits. Marigolds are easy to grow and can also be planted in a vegetable garden near tomato plants to help keep tomato hornworms away. Chrysanthemums: Repel roaches, ants, ticks, fleas, and many other pesky insects. Flying and crawling insects avoid mums due to a fatal ingredient called Pyrethrin, which is toxic to bugs but safe for animals. Geraniums: These brightly colored flowers are known to repel mosquitoes, leafhoppers, and Japanese beetles. They come in a variety of colors and last throughout the spring, summer and early fall. Rosemary: Repels mosquitoes and a variety of other insects that can prove harmful to your garden. Rosemary can be planted in containers or in the ground, can be used to season vegetables and meats, and can also be burned for a natural form of mosquito control. Lavender: Considered an effective deterrent for flies, fleas, mosquitoes and other unwanted insects. Lavender is also renowned for its calming properties and the versatility of its oil. Basil: This leafy green herb helps deter house flies and mosquitoes, and makes an excellent filler plant in your flower or vegetable garden. As an added bonus, it’s a tasty addition to many soups, salads, and chicken recipes. 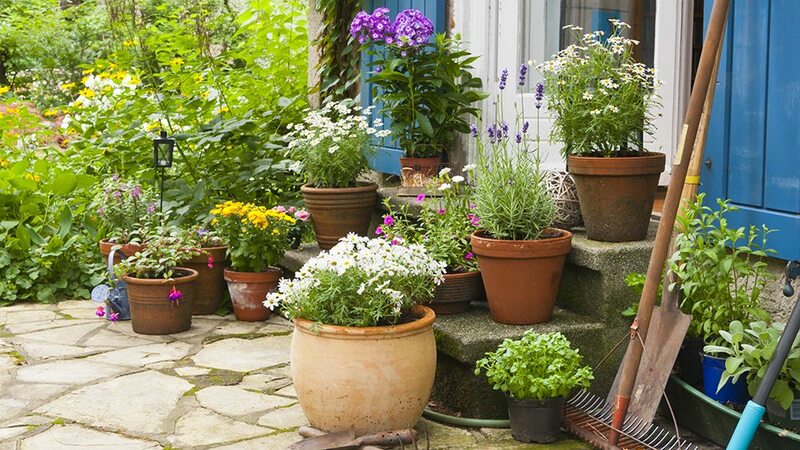 It’s important to note that these plants do not repel all insects and will not eliminate insect activity entirely. You might also consider using a variety of plants that can attract carnivorous insects, such as ladybugs, which will feed on other garden pests. pleasant background noise when enjoying the outdoors. Birds spend their days eating the pesky bugs in your yard, so there are reasons to want them around. However, birdbaths and feeders are a common offender linked to pest activity that many people don’t consider. 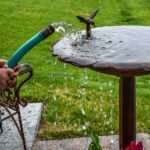 Birdbaths, along with other standing water sources, are a mosquito breeding ground. These annoying bugs transmit a variety of diseases that could prove fatal to both humans and animals, such as West Nile Virus, Zika, and canine Heartworm. Mosquitoes seek out still water to lay their eggs, which only take between 24-48 hours to hatch. They can lay up to 200 eggs at a time. So by letting water stand for even a few days, you can have a dramatic increase in the number of mosquitoes around your home. If you incorporate birdbaths in your landscaping, make sure to dump the water out and replace it daily. It is also recommended to leave watering cans, buckets, and wheelbarrows in a covered area so they do not collect water during a rainstorm. Many of us have experienced the battle of keeping squirrels out of our bird feeders. Those fluffy tailed rascals are not the only rodents drawn in by the presence of birdseed. Mice and rats are quite fond of foraging on the ground in search of spilled seeds for an easy meal. Once attracted by a food source rodents can locate entry points to your home and take up residence within your walls. Once inside they can begin breeding prolifically, spreading bacteria and disease. They can also bring with them other unwanted pests, such as fleas and ticks. So you want to keep them as far away as possible from your home! 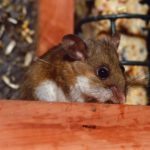 Aside from placing bird feeders a distance from your house, you can also lessen the potential for rodents by storing the seed in rodent-proof containers, such as a metal can with a lid. Attaching a seed catcher to your feeders will limit the amount of seed that drops to the ground. While these tips and tricks can help limit the pest activity around your home, they may not eliminate the problem entirely. That’s where we come in! At Modern Pest Services, we offer a variety of programs designed to help protect you and your home against all things creepy and crawly. Our HomeCare Green program offers year-round, seasonally-targeted protection against 60 different pests with your satisfaction guaranteed! If ticks and mosquitoes are preventing you from enjoying the great outdoors this summer, we can help. Our new Mosquito and Tick Control program provides monthly treatments from May through September to eliminate blood-sucking pests from your yard. Give us a call at 1-800-323-PEST or contact us online to discuss your options or request a free quote and get started today!